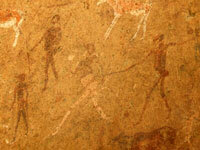 The Brandberg Massif is famous for its thousands of rock paintings and engravings. Its most celebrated piece is the 'White Lady', estimated to be around 2,000 years old. It's located on an overhang under a shelter, surrounded by a variety of painted animal forms. The trip to see it is well worth the hour-long walk to the Tsisab Ravine. Contrary to its name, the painting isn't actually of a white lady. Instead, it shows a male with the white colour representing body paint which suggests it is a medicine man. Discovered in 1955, there has been a great deal of controversy over the meaning and origin of the painting. The mountain is a sacred place for the San tribes in the region. Brandberg's highest peak is Königstein, and at 8,550 feet (2,606m), it is the highest mountain in Namibia. It's reachable on organised hikes which take about three days and follow various routes ranging in difficulty and length. The area is wild and unspoiled, largely uninhabited by people, but home to a number of desert animals including elephants and rhinos. The landscape is extremely arid and beautiful in a barren, intimidating way.